You already know all the songs. You already have positive, negative, or otherwise associations with the songs. 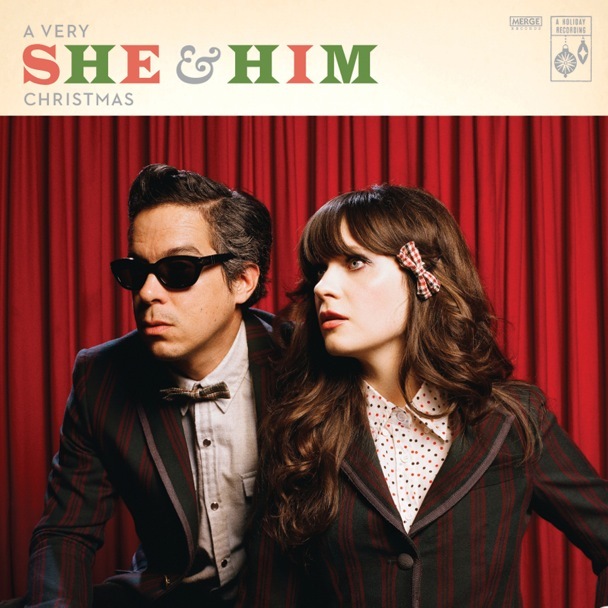 The real wildcard when it comes to She & Him's A Very She & Him Christmas is weather or not you like Zooey Deschanel. And not just Zooey Deschanel as an actress or person, but her voice, the syrupy dulcet tones that are both precious and breathy, and if you like the "idea" of Zooey Deschanel making a Christmas album. I don't bring M. Ward into this because he's just not divisive. Also, he brings another round of strong, but subtle guitar garnishment and occasional backing vocals to this newest She & Him entry. It's not that he's a non-factor, but he's the unsung hero of the band. He keeps them moving and he provides the sonic decoration in the form of their pseudo-'50s echo-y guitar, but he's just not the face. But, anti-Zooey-ites, assuming you exist, there is nothing here to complain about. Her vocals are calm, and perfectly suited to these standard classics. And if anything, she avoids any vocal histrionics of any kind. This may be an indie-rock album, but it's charmingly traditional (excepting some echo, and vocal overlay effects) to the extent that you could sit by the fire, burn a Yule log, drink some Wassail, and hope that the Chim-in-ney Sweep isn't in Santa's way. In short, it's beautiful. Deschanel excels particularly on "Christmas Wish" where her occasional, charming, geographically-confusing drawl is perfect. But songs like "Have Yourself A Merry Little Christmas" is another treat too. M. Ward does some interesting stuff on "Sleigh Ride," frolicking up and the neck of the guitar and providing additional vocals. And then "Rocking Around the Christmas Tree" has some style too, but She & Him don't do anything crazy with it, save for some more solid guitar riffs from M. Ward. "Blue Christmas" is one they knock out of the park, but that's just as easily because of the quality of the song too. And their rendition of "Little Saint Nick" by the Beach Boys is wonderful, though not too far from the original. The bottom line when it comes to A Very She & Him Christmas is whether you like She & Him AND you like Christmas songs. Those are the components in question. If you like both, then you will be pleased by this heartwarming, not-too-challenging set of songs. If not, then you're just well off with classical versions of the songs. For me, it's a great, peaceful, sometimes semi-jaunty mix of great holiday tunes. "The Christmas Song" as the album's closer, nearly got me choked up, but it's a beautiful song that cannot be denied. Give the album a listen below. Let it soundtrack a snowy night (like this one, here in Denver) and then decide whether you need it or not. It could be an integral part of your holiday collection. If you have a holiday collection. No matter what, if it doesn't warm your heart, well, go get your Grinch card now, because it's probably two sizes too small. And on an unrelated note: R.I.P. Napster. You were a cute way to get viruses and lawsuits filed against you in college, but you did open up the internet, and potentially strike the knock-out blow that started the death of the Old Music Industry.